Mormonism traces back its history in modern times to its founding prophet, Joseph Smith Jr., and his “First Vision.” Joseph was a young farmer boy who lived in western New York, born in the early nineteenth century. This was the time of what’s known as the Second Great Awakening, and where Joseph lived is known as the “burned-over district.” It was a time of much Protestant religious excitement, revivals, reforms, and the formation of new religious movements and denominations (which eventually included Mormonism). A Restoration Movement grew in popularity in the area, which involved ideas of “restoring” a pure, primitive, uncorrupted, and original form of Christian faith. It was in this atmosphere of intense religious excitement, reform, and restoration that Joseph lived, and there were many competing religious claims in the area. According to his history, Joseph did not know which church to join, and this greatly distressed him. At the age of 14, he decided to ask God which of all the churches was right so he could join them and so his soul would be well with God. It was this event that Mormons point to as the beginning of their “restoration” of the true “gospel of Jesus” in modern times. It is said that Joseph was called to be God’s prophet beginning with this vision, later receiving the authentic priesthood authority from God, and organizing a church which is considered to be the “Lord’s Church.” The largest denomination of this movement today is known as The Church of Jesus Christ of Latter-day Saints, headquartered in Salt Lake City, Utah. I grew up a member of this church, and although my spiritual journey has taken me beyond it, I still value the deep truth in it, as I will attempt to describe below. I perceive that there is much truth in the story of the First Vision, but I think the common narrative is failing, or has failed for many people, and we need radical new interpretations of what happened in that grove on that spring morning in 1820. I will offer an interpretation which I think makes more sense in our modern world but which I think still maintains a deep spiritual power, pointing to classical mysticism as it has been experienced throughout history. If you have been following this series of posts, you may note that there are some significant issues with the traditional narrative. Perhaps the most conspicuous is that if God the Father and Jesus are not literally embodied persons living somewhere out there in the universe today, then they could not have actually appeared in Joseph’s vision as such. If Joseph didn’t literally see and interact with the Godhead as two embodied persons, then what actually happened? Was Joseph lying? Did he simply make it all up? If not, what did he actually perceive and experience? Who was he talking with? Was he talking with anyone? What meaning might his vision have for us personally today? Does it still relate to the Christian tradition, and spirituality more broadly? One thing that the traditional Mormon narrative seems to emphasize is that this experience that Joseph had was profoundly unique and singular; no other person in modern times has had such an outpouring of divine manifestation and vision as Joseph had, and that Joseph was uniquely and exclusively chosen by God for this experience and mission to restore the true gospel and the true church. I think this perspective is mistaken. There are many people who have had similar visionary experiences of the Divine, and some are described in very similar terms as Joseph’s accounts. I have published over forty of them here on this website to date, and there are many more. I don’t think sharing these experiences devalues or diminishes Joseph’s experience, but rather corroborates it. They show that these experiences do, in fact, happen, they are real experiences, they are incredibly powerful, they are life-changing, they reveal depths of experience that people actually have that seem to have ultimate import and meaning. These are typically referred to as mystical experiences, which are a part of mysticism, and they seem to be much more common in humanity than most people typically think. noetic – there is a profound depth of truth that is revealed, understood, grasped, things that one never knew before, or had ever considered. There is a strong authority to the experience, and the truths gleaned seem to be supreme. objectivity – there is a reality to the experience that is extraordinary, being more real than real, deeply real, transcendentally real, as if ordinary life is a vague daydream in comparison. transiency – the experience comes and goes. It is not permanent. It opens as a kind of vision, and then shortly passes. But the effects of the vision often persist for long after the experience itself, sometimes changing one’s life entirely. passivity – the persons who have these experiences did not necessarily seek them. They seem to happen spontaneously for many, unbidden, out of the blue, not willed, as a “grace,” or in unexpected ways. sacredness – the experience seems to be deeply holy, sacred, pure, divine, reverent, beautiful, imbued with sanctity or godliness. positivity – the experience often brings a tremendous peace, tranquility, love, positive mood, heart opening, rejoicing. time & space changes – the perception of time and space often shifts, sometimes significantly. People feel as if they are taken to a different realm than the ordinary, sometimes heavenly, sometimes hellish, and it can seem either timeless or an eternity. They often don’t know how long they were in the experience. unity – the person often feels as if they have united with a divine entity, enveloped in a divine essence, a bright light, merged with a God or One or Ultimate or Ground of Being. paradoxicality – the experience seems to defy logic, reason, rationality. Things happen that simply can’t be explained, understood, intellectually computed. There is somehow a unity of opposites, a complete reconciliation of all paradoxes, conflicts, incompatibilities, divisions. These types of mystical experiences seem to be the catalysts that often start new religious movements. Some prominent examples would seem to include Siddhartha Gautama’s awakening experience under the Bodhi tree which made him the “Buddha,” and is the beginning of Buddhism. After sitting for a time in meditation (a form of prayer), wanting to know the truth, and after fighting the dark demon “Mara,” he received enlightenment which revealed the truth of existence. He thereafter began to teach others how they might come to the same insight of truth. There is also the story of Muhammad’s “first revelation,” who according to tradition was in a retreat in a cave praying and contemplating about creation, ignorance of the divine, and seeking truth, when he suddenly had a vision of the archangel Gabriel who began to reveal profound truth to him. He was taught and “endowed with wisdom,” which became the revelation of the Quran, and he began teaching others as a prophet which began Islam. Such a mystical experience may have happened to Jesus at his “baptism”, when the heavens seemed to open and reveal truth of his Sonship/Messiahship from the “Holy Spirit” descending from God, which was the beginning of Jesus’ ministry and the beginnings of Christianity. The Apostle Paul’s conversion experience on the road to Damascus might have also been a similar mystical experience as Jesus had, which Paul immediately recognized as Christian, and he became one of the instrumental figures in spreading Christianity. Other examples could include John Calvin’s “religious conversion,” where after going through intense turmoil he suddenly received a “taste and knowledge of true godliness,” and subsequently taught a theology that became known as Calvinism. John Wesley had his “Aldersgate experience,” wherein he was deeply depressed and during a church service suddenly “felt [his] heart strangely warmed,” received an assurance of salvation, and whose subsequent teachings developed into Methodism. Ellen White had an intense “First Vision” experience while praying, which developed into the Seventh-day Adventist Church. Ann Lee likewise while in prison had a “revelation” which unveiled ultimate truths about God and salvation, which developed into the Shakers. Other examples could be given from other traditions. These experiences can be so deeply mind-altering, life-shaking, soul-transforming, that the people that have them often feel called to go out into the world and try to teach what it is they experienced, the profound truths that they believe they’ve glimpsed about the nature and soul of humanity, and how we might lead a full, rich, and saved or enlightened life, even as they feel they themselves have been so resurrected or awakened to the reality and truth of life. How do we make sense of these mystical experiences, these spiritual experiences that seem to be the most profound and meaningful experiences in the lives of the people who have them, that seem to reveal the very nature of life itself? I suggest that that is essentially what these people are experiencing—the nature of LIFE itself. They are having conscious experiences of what it means to be a conscious living being, what the nature of that consciousness is, where that consciousness comes from, the deep unity of their consciousness with the totality of the cosmos, the reality of what it is to be alive, to have a mind, to be aware, to know, to think, to experience anything. They are realizing their life, the essence of being. The cosmos itself seems to wake up in them, and they come to know they are that cosmos. The reality of their life seems to fold back in on itself and reveal itself, the nature of life, being, consciousness, reality, identity, and this is ultimately meaningful, for it seems to represent the key to the ultimate questions of who we are, and what we are doing in this life, and the nature of reality itself. It seems to be a deeply mind-altering event, a shift in consciousness, an altered state of consciousness, a change in perception at a deep level of conscious awareness, even consciousness becoming aware of itself (see the Greek metanoia). The functioning of neuronal activity in the brain seems to change patterns from being engaged with thoughts of self, ego, past and future, and other concerns of the finite mortal body-mind, to being aware of a wholeness, a unity of all experience, a purity of consciousness, the eternal nature of reality, a peace and rest of being which is our ultimate identity in the infinite cosmos, as the cosmos. This is sometimes experienced as a visible Light brighter than any other light, the source of all light in consciousness, which is consciousness itself, the stage upon which all conscious experience is experienced, but seen in its absolute pristine purity. The ego-self in the mind/brain experiences a kind of “death” or sacrifice of “self,” the “self” that thinks it’s separate from the world. The neural networks that generate our sense of this separate “self” in consciousness can entirely deactivate, which opens up this vision of ultimate reality in consciousness, and that reality is absolute salvation in one’s true nature as the cosmos itself, or “God.” The unity, oneness, or nonduality with this Ultimate Reality is so strong it is sometimes referred to as Love itself, the One, the Source, Divinity. It is who and what one really is, revealed to itself. The truth that becomes known in this type of experience is one that is necessarily of a private and personal nature. Because it is a revelation of the true nature of consciousness to itself, it can only be witnessed and experienced in its full, true, genuine nature in one’s own consciousness. One cannot give it to another through any form of communication (not even this one). So what is it that these people are teaching then? It seems to me that they are interpreting their experience, just as I have above (of mystical experiences that I have had). These interpretations are all necessarily fallible, incomplete, conditioned, symbolic, abstract, referential, and not absolutely true, ever. It is the mind’s attempt to intellectually construct meaning of an experience that is pure consciousness itself, and the deep Love that is experienced in this fundamental state of awareness of reality. But no construction of that experience, whether in thought or word, is the experience itself. It can never be the experience itself, no matter how eloquent, articulate, or expansive. Only this experience of pure being knows itself in absolute purity. Nothing else can reveal it, but itself. In addition to trying to express something of the experience itself, many of the teachings seem to be ways of helping point others into ways of having this divine experience of their own, to realizing this ultimate reality of their own, being brought into the “Presence of God,” so they may know it in its full truth and purity within their Self. They are trying to help others experience Ultimate Reality, God, the Self, the true nature of consciousness, of Life, of Love, of Being. Each of these people that try to express themselves must often express themselves in ways that the mind is already familiar with, ways they have been conditioned, by knowledge they have learned, religious systems they’ve been introduced to, philosophies that they have already understood, the environment in which they find themselves. Of course, they can construct new symbols to try and better articulate what they have experienced, new reifications of the ineffable experience, and they will have more or less success in doing so depending on how well their contemporaries accept the new constructions. But they almost always use many existing elements from the surrounding culture and knowledge base and language in order to try to communicate themselves, which is why I think their teachings often seem to be different from one another depending on the places in which they emerge. In addition, the further they are in time from the initial mystical experience, the more they diverge from that Source as well, which is why I think new mystics often break in major ways from their contemporary religious environment, and begin new religious movements to help bring others back to the “truth” of being, the “truth” of reality, the “truth” of life and consciousness that has been lost. 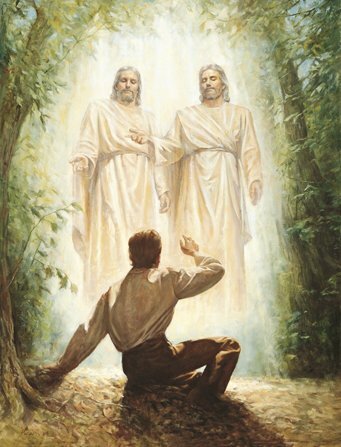 I suggest that Joseph Smith may have been experiencing one of these deep mind-altering, consciousness-revealing, life-awakening mystical consciousness events in that grove of trees in early 1820. I think he was experiencing the true nature of Life itself, of his own consciousness, of his own deepest being that is one with all things. I think he experienced it entirely within his consciousness, because it was of his consciousness—purified, illuminated, untainted, whole/holy, sacred, ultimate, love-filled Consciousness. He came to know his being in God, in Reality, in Nature, in the Cosmos. He came to know his true nature, the Divine Self. Is there evidence of this in Joseph’s accounts of his “First Vision” experience? I think so. First, as I noted in the beginning, what about the embodied nature of God? Did Joseph really see two persons of flesh and bones, or did he not? It seems that if there were actually two prominent divine persons present in the vision, that he would have mentioned both in this account. So why didn’t he mention it? Why did the two persons only show up in his later 1835 account? I don’t think this was intentional deception on Joseph’s part. I think it was his mind reifying a fundamentally ineffable, indescribable, translinguistic, unitive mystical experience that went far beyond all concepts, thoughts, forms, ideas, persons, and religious symbols. I perceive that his mind was trying to put an experience that transcends all normal limits of reason and rationality into concrete symbols, concrete realities, even physical forms. He was bringing “heaven” down to “earth.” And the forms with which he and his contemporaries were familiar were those of the Christian Godhead, namely the Father and the Son (Jesus). And so those are the forms that his mind interpreted the qualities of the experience to be. Joseph’s mind may have tended to reify this into the separate form of Jesus, and then eventually into the two forms of God the Father and Jesus. What if his mind kept reinterpreting and reifying his experience, splintering what was originally a unitive nondual divine experience in himself into more and more dualities, separate forms, external Christian symbols, messages, words, meanings. What if it was his unconscious mind that tried to put his experience into these culturally accepted forms so that others could understand something of the divinity of his experience, but it was not ultimately or absolutely that way in the experience itself. I suggest that this may be the case. It is also possible that he consciously chose to so reify his experience so he wouldn’t be attacked for claiming to be Christ himself. But the idea that Joseph may have perceived Christ in himself as his true Self in the First Vision does not seem to be too out of place since Joseph explicitly gave many subsequent revelations in the first-person voice of Christ, which are now found in the Doctrine and Covenants. I don’t think Joseph literally saw God the Father and Jesus suspended in the air above him in the forest. I think he experienced God within him, within his mind, within his consciousness, even as qualities of his own deepest being, which had all the qualities of an ultimate “God the Father” and “Christ” with which his mind was familiar, and so his mind shaped the expression of the experience into those familiar forms. One of the primary reasons why we might consider that the experience happened entirely within Joseph, within his mind/consciousness, is that Joseph seems to say so himself. (This might seem like a double standard, in accepting more plainly what he says here, but not in other places such as the bodily nature, but such is the difficult and complex task of interpreting mystical experiences, particularly second-hand. Some things come through clearer than others, and should not all be interpreted as having equal validity). When I came to myself again I found myself lying on <​my​> back looking up into Heaven. In the handwriting of James Mulholland. Notice that he mentions his “self” twice; first, that he “came to [his]self again,” and then second, that he “found [his]self.” It seems he had been quite outside of his normal sense of “self” during the vision, and only afterwards returned to his “self.” I think this is evidence of those parts of the mind/brain that construct and maintain the sense of “self” shutting down during his experience, and of him being taken into a state of consciousness without the typical “Joseph” there. It seems he was not experiencing this vision as “Joseph,” per se, but as consciousness itself, pure, unadulterated, unindividualized, unseparated, unselfized consciousness. This consciousness is whole (holy), undivided, unconscious of a “self,” and therefore perhaps unconscious of the “self’s” problems, sins, errors, delusions, anxieties, guilt/shame, separateness, fallenness. Perhaps this is what Joseph experienced as a remission of his sins, which is one of the very first things that he notes in the 1832 account as being revealed to him by God: “thy sins are forgiven thee.” Perhaps this is because he had no sense of his Joseph “self” at that moment, no “separate self” which would divide him from God and therefore cause “sin.” He was once again wholly pure, sinless, egoless, undivided from God, the Light of Consciousness that was God had filled consciousness completely. In the earliest account he says he was “filled with the spirit of god;” I think that is perhaps because he was no longer feeling separate from God, but was one in God, God’s “Holy Spirit” filling him entirely, this “third” member/quality/aspect of the Godhead was also him, his true Self. What was that experience of darkness prior to the light in Joseph’s First Vision, that thick powerful darkness? I suggest it was a classic “ego death” experience, a “dark night of the soul.” I think it was the experience of his “Joseph self” falling away from consciousness, and this may have been caused by his deeply prayerful state of mind, and also perhaps by his existentially distressed and confused state of mind that caused a deep disruption of his ego. The ego construction does not like its own dissolution, which feels like death or destruction, and so it fights this tooth and nail, with “fire and brimstone” and “gnashing of teeth.” The apocalypses of scripture I think are referring to this kind of passing away of the ego from the conscious mind, which then reveals the true nature of the mind, even Consciousness itself. Joseph notes that it was “at the very moment when I was ready to sink into despair and abandon myself to destruction.” I think he actually did abandon his “self” in his moment, and it is only when he let his “self” go, surrendered his “self” entirely to God, that the Divine Light appeared in consciousness, and was that Consciousness, that Life, that Energy of Pure Being, Pure Awareness. The “dark clouds disappeared,” “darkness gave way from his mind.” I perceive it was his ego-self, sometimes referred to as the “natural man” or “carnal mind,” that disappeared and gave way from consciousness. Without his ego-self and its thoughts to obscure his vision of reality, he perceived things as they really are, the truth of Being. As I’ve already mentioned, in this state of egolessness, sinlessness, without a consciousness of a divided and separate “Joseph self,” I think he perceived that he was perfectly One in God. This, I perceive, is “Christ” consciousness. This is the “Atman” that knows itself as One in “Brahman.” This is the “Buddha-nature” that is One with Reality itself, with no-self (anatta). This is the “Messiah,” a state of consciousness in which we perceive with purity, beauty, and truth the “Anointed” nature of our own being in God, in the Cosmos, in Reality. It is the “Tao,” the pure absolute principle underlying all things, including our own being. It is whole, complete, fulfilled, and perfect. He knew God, and God was him, his true nature, his true Self, underneath the egoic mind. It is the God-given purity of consciousness and awareness and being that is given freely to each and every being that has being. It is the Source in which all experience and creation appears. And it is in each one of us, and is the basis for each and every conscious experience of the world and cosmos. The ego-self in God is “crucified” for its “sins” of separateness, and we come to know in that moment that Christ was underneath it all, the consciousness which unites us all in God (see Galatians 2:20). This consciousness is eternal in all living things in the universe, and is that consciousness. It is the consciousness that arises from matter, and which comes to perceive it as matter. It is the cosmos that comes to perceive and know itself in us, as the astrophysicist Carl Sagan once famously remarked. I suggest that Joseph’s perception that none of the churches was “right,” that they were “all wrong,” was because nothing that the churches teach in words about God is absolutely God, it is not God as God actually is, as Joseph was now truly experiencing God. And much of their teaching had diverged so far from the experience of God that it can scarcely be traced back to or point towards what God is in Reality. Again, the descriptions of experience, the words, symbols, concepts, ideas, thoughts, forms, doctrines of God can never be what God is in itself, the direct experience itself. What is the “gospel”? It is the direct experience of God, knowing God as God is, and by so experiencing God in one’s self as one’s true Self, knowing that “eternal life” and “Christ” is the fundamental nature of each and every being that is. This is the “Good News”! That we are already one in God, the Cosmos has already birthed us into itself, and we are never separate from Reality, but are the way that God-Reality manifests itself. And yet few come to know this. As the ancient Greeks and Egyptians knew, the deepest wisdom was “know thyself.” For in this one knew “the universe and God,” which were One. The words that the religions all use, the words that come from their “lips,” are not God, but only point towards God, more or less effectively. The only way to truly “draw near” to God is by experiencing God directly within one’s own “heart,” in one’s own consciousness and being. I think this is a common experience among mystics, the realization that no institution, no book, no teacher, no doctrine, no theology is absolutely true of God, but they are all relative and fallible, only pointing towards reality, only abstractly referring to direct experience, only helping to guide others to the experience of reality itself and of the true nature of their lives. Anything finite cannot ever truly express the infinite nature of Reality. When the Indian saint Babaji had a vision of Jesus, it was a similar message that he intuited: “My followers [Christians] have forgotten the art of divine inner communion. Outwardly they do good works, but they have lost sight of the most important of my teachings, to seek the Kingdom of God first.” They did many external outward works, but had not known the Kingdom of God within them (Luke 17:21). In another account it says it “[left] his mind in a state of calmness and peace, indescribable.” I think he experienced such love, joy, and peace because he had just experienced God consciousness, a pure state of consciousness wherein God is experienced as one’s own consciousness. But, and this is where it gets tricky, it is not the consciousness of the ego-self. The ego-self is not God, and never will be. The ego-self emerges from God, from pure consciousness, as a construction within consciousness, made up of consciousness. The ego-self and body-mind is a manifestation of God, an emanation from God, a Child of God, but this never actually becomes separate from God, but remains wholly within God even though it appears to the ego-self that it is separate. It is an illusion of the ego-mind that it is separate from ultimate Reality, God, Cosmos, Source. Seeing through this illusion, as when the ego-mind drops away from consciousness, and one perceives the holistic nature of Consciousness and Reality, and one’s fundamental oneness in That, is what is symbolized in scripture as the “veil,” and piercing the veil, tearing the veil, passing through the veil, in my interpretation. This is a radical new interpretation of Joseph Smith’s First Vision. I don’t think Joseph literally saw two embodied persons that were God, but rather experienced his own internal embodied spirit being and consciousness as Ultimate Divine Reality, which his mind later interpreted and reified into the external dualistic forms of the Christian Godhead. I don’t think Joseph was lying, but sincerely trying to put fallible words to a fundamentally ineffable mystical experience. He may have truly “seen” some of the things he said he saw in his mind’s eye, in vision, his mind interpreting the experience of God into those familiar forms in real-time in the visual cortex of his brain, but I think it took a significant amount of time after the experience itself for his mind to dress the experience in words and concepts that would make sense to himself and his contemporaries. And since the interpretation of mystical experience is never absolute or complete, it continually morphs and changes as the mind tries to better articulate what was experienced, which would explain why Joseph’s accounts shifted over time. In my interpretation, Joseph didn’t communicate with any outside entity other than the reality of his own deepest Being and Consciousness “outside” of his psychological “self” construction, and it was this deepest Being that was divine. He came into direct contact with the pure Consciousness that sits underneath or behind the veil of the ego-self, and upholds it, which is like Consciousness becoming aware of the Light of Consciousness. And this was likely not any kind of standard communication in words, but a deeply felt intuition, an immediate experience, a direct insight, an experiential knowledge. The “message” could have been “communicated” in full in a single instant of the conscious experience itself, which his mind later tried to put into words, and utilized familiar scriptures to do so. It is in this way that I think Joseph’s experience might be viewed within the larger world of mystical experience and pluralistic spirituality. It is this kind of contemplative mystical experience that I think most religions have emerged from, and which they try to point back towards to help people experience. I think it is the radical wholeness, oneness, purity, selflessness, love, truth, and peace that is directly experienced in such states of consciousness that may be the source of religious teachings, dogmas, scriptures, theologies, practices, rituals, doctrines, symbols, etc., being the ways the experience of God is interpreted, and the ways one may return to experience God. It is this experience and its fruits that is the “Presence of God” that so many religious and spiritual people hope for, the theosis that has been said to be the purpose of human life, which is directly realizing in truth one’s very own nature, which is the nature of all others too, the truth of one’s consciousness and all consciousness in this universe, which is one or non-dual with Reality itself, or God. Once one has had such an experience of one’s own true nature, their life is changed forever, for they know directly that they are not really living their life (ego), but they are living God’s Life, Christ’s Life, the Cosmos has come alive in them and everyone else. What do you think of this interpretation? Does it help you make more sense of Joseph’s “First Vision” experience in today’s world? How do you interpret the experience? Where do you see difficulties in this reconstruction? I’m interested to hear your views. Please share your thoughts in the comments below or on Facebook. I like your interpretation. I wonder if Joseph experienced the vision repeatedly over time and was able to go deeper or understand more of it with time. It makes sense that it was a vision, not a literal appearance. It is consistent with so many others. Its so interesting to read the visions of other people. I long to experience this myself. When the student is ready the teacher appears…. Yes, I think Joseph may have experienced something similar many times. The “light” of “Moroni” entering his room at night I think was a similar mystical “light” or illumination of mind, and did not literally take place in his room. I note in these posts how I interpret that God resides in embodied persons, that I think this is the revelation of the Incarnation, God manifesting “Himself” throughout creation, including in humans. What I don’t believe is possible is that there is a man, or two men, living out in the universe somewhere known as the “Father” and the “Son.” I think this dualistic personified interpretation of divinity has failed for many people, and does not reconcile with what we now know about Earth, the evolution of humanity, or the universe. I suggest we need a new interpretation of the Godhead, a reconstruction of the narrative that makes more sense today. I think the “Father” and the “Son” reside within us, right here and now, in our body-minds, in all of humanity, and life itself. I suggest that God the “Father” has manifested “Himself” in us, spirit joining matter to form material beings, and this materialization of spirit in Life is the “Son.” In my interpretation, when we come to mystically realize we are one in God, when we “handle ourselves and see” the deep truth of our divine nature, the union of spirit and matter in our mind and body, then we realize the “Father” and the “Son” in us, as Jesus prayed we might (John 17:21-26). I think this may be a better interpretation of what Joseph experienced in his First Vision. The Godhead was not separate from Joseph, but one in him, qualities of Joseph’s divine nature and consciousness that were being revealed to him in his mind. And we may come to know this too, in ourselves. “Hogen, a Chinese Zen teacher, lived alone in a small temple in the country. One day four traveling monks appeared and asked if they might make a fire in his yard to warm themselves. While they were building the fire, Hogen heard them arguing about subjectivity and objectivity. He joined them and said: There is a big stone. Do you consider it to be inside or outside your mind? “One of the monks replied: From the Buddhist viewpoint everything is an objectification of mind, so I would say that the stone is inside my mind. The monk was arguing for subjectivity alone, but in true Zen realization, you understand that subjectivity and objectivity are not really different. You can’t have one without the other. That may be, but it doesn’t make that interpretation false. To “don’t believe” in that way means discounting the plain meaning of the scriptures, the historical record, and the statements of various witnesses. That’s a pretty specific (and recent) witness. Alexander Neibaur, one of Hugh Nibley’s grandfathers, was a Jewish convert to the Church. There are many more such statements, and I believe it’s short-sighted to ignore them, “mystify” them, or try to explain them away. So I repeat, even from a mystical point of view, there’s nothing to prevent God the Father and Jesus from also being literally embodied persons—just as you and I are literally embodied persons but also much, much more. Hi Jack. I’m sorry for the delay publishing your comment. For some reason your comments were going into my spam folder. I’ll have to keep a closer eye on that. Again, thank you Jack for sharing your thoughts. I think it is in this kind of dialogue where we can compare and contrast and consider different perspectives. In D&C 130:3, I suggest a “personal appearance” of the Father and the Son may also be an appearance in the “person” themself, and all people. I agree that they don’t “only” dwell in the human heart. They are manifest in our entire body, all beings, and throughout the Whole of creation. If we were to take John 14:23 even more literally, we might think they were moving in to our house, but this is clearly not the case. I suggest it has a more spiritual meaning of recognizing God in ourselves and all things. In D&C 130:1, yes, when the Savior appears, we will see that “he” is “like ourselves.” I suggest that a key to this verse is the last two words, “like ourselves.” We will see “him” because we have become like “him.” Like knows like. When we become purified of ego, we see the Savior in our Self because we have become just like “he” is, “purified even as he is pure” (Moroni 7:48). We see that pure consciousness in our Self. Thank you for sharing the Zen story. Yes, I agree that subjectivity and objectivity are not ultimately different (or separate). They are two sides of the same coin. We like to objectify many things, and I think we’ve unfortunately done this to God too. We’ve made God into an external dualistic object, something or someone “out there” apart from us (the subject). But if subject and object are not separate, but One, then that means God is not really external from us, but One in us, part of our own subjectivity, or subjective consciousness. And perhaps even far deeper than our typical egoic subjectivity, but the activity of Consciousness itself in which all dualisms of subjectivity/objectivity arise. We’ve lost that subjective element of God, and it seems that this is where God may truly be known. God can never be known as “an” object, a single “thing” out there, or even two people “out there.” God’s being pervades all creation, including ourselves, for in God “we live, and move, and have our being” (Acts 17:28). So we won’t find God as an object or objects anywhere “out there.” As St. Irenaeus – “We can never know God as an object but only by sharing in God’s own self-knowledge.” This happens inwardly, by participating in God’s knowing of Self in us, as the Subject, and in realizing the union of subject/object, mind/body, spirit/matter in us. One of the main reasons I think the dualistic personified literal interpretation of divinity is mistaken is because it doesn’t seem to reconcile with anything we now know about nature, or the universe, or the Earth, or the evolution of life and humanity on Earth. Human biology as it exists today has only been around for a couple hundred thousand years; before that, it didn’t exist as such. I suggest that our interpretation of the scriptures, historical record, and statements of various witnesses needs to be adjusted, updated, reframed, reinterpreted, reconstructed. I do think that “witnesses” of God may come in various ways, some more or less dualistic, and one of those that seems more dualistic is as a visionary projection of the mind in the mind’s eye. We may “see” God or Jesus as an external object in a vision or dream (perhaps as Joseph saw them), but I don’t think that means that they are literally external embodied persons somewhere. We don’t see them with our “natural eyes” as the scriptures attest (Moses 1:11), but our “spiritual eyes,” the eyes of our mind, heart, and spirit, inwardly. I think the personification perceived may be a familiar form that our minds use to construct and make meaning of nondual transcendent experiences. The 13th century Christian mystic, Meister Eckhart, noted, “Simple people imagine that they should see God as if he stood there and they here. This is not so. God and I, we are one in knowledge.” And, “I am converted into Him in such a way that He makes me one with His being, not similar. By the living God it is true that there is no distinction.” I perceive this is the ultimate unitive nondualistic vision of God, wherein it is realized that we are One. I think that we may converse with another person who has been so fully “converted” into Christ consciousness that we can “see” Christ in them, this purity, this light, this grace, this truth, this love. They reflect the Christ, this “anointed” whole/holy nature. I think this may be what happened between Peter and Jesus (Matthew 16:15-16). It’s interesting that it was not “flesh and blood” that revealed it to Peter, his natural bodily senses in simply looking upon Jesus’s body, but “my Father which is in heaven,” or by deep spiritual means. I do believe that the Father is real, and the Son is real. I would say that I know this from personal mystical experience. But I don’t think these may be found literally in two distinct embodied people living somewhere in the universe. I think that interpretation needs to be retired because it is in conflict with the truth we now know about the nature of the world. God is Truth. If we don’t update our interpretations according to new knowledge and understanding of the world, then I think spirituality may be lost. I think it is already being lost among many people, particularly young people. And when we lose spirituality, I think we lose our connection to ourselves, our humanity, and each other. We lose our sense of divinity, that which connects us as One in Love.